Providing you the best range of kraft look pouches with window, stripped paper pouches and kraft paper pouches with effective & timely delivery. With our vast experience in this domain, we have enabled us to serve our clients with a broad array of Kraft Look Pouches With Window that is available in various sizes, design and colors to meet the diverse needs of the clients. Designed and manufactured using quality approved raw material and modern machinery, the offered pouches are used for packing of food products. Clients can avail these pouches at pocket-friendly costs. 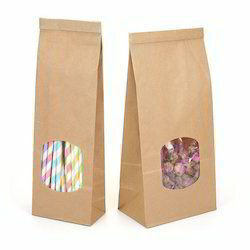 Leveraging on our industrious professionals, we are offering a supreme quality range of Kraft Paper Pouches that are used for packing various materials. Offered pouches are manufactured and designed by our skilled professionals using high grade plastic keeping in mind the latest market trends. The offered pouches are highly acknowledged for some of their striking features. 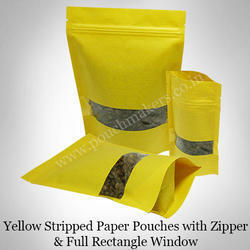 The offered pouches are available in various designs, patterns, colors and sizes.